So, Thor opens this week, and early buzz is that it's the best Marvel movie made to date. Far be it from us to not try to cash in on others' popularity, so we're going to try something a little crazy this week: a new Thor review every day this week, until the movie opens. Can we do it? Let's find out. Agent Coulson is one of S.H.I.E.L.D. 's top agents. His experience in the field and working with super-powered beings has prepared him to deal with almost any situation. But is he ready for Earth to become a battleground for the universe's mightiest warriors? Agent Coulson is the C-3PO or R2-D2 of the Marvel flicks: the mundane character who ties them all together. He's played by Clark Gregg, whose head doesn't really lend itself to the Minimate shape, sadly: there's no way to get his strong, square chin on a tube. One of the cleverest things about the SHIELD Agents in Iron Man was that, like in the comics, they wore blue and white - this Minimate's suit is black, which is a bit of a letdown And in fact the jacket piece is matte black, while the arms are gloss, so they don't look like they belong together at all. He gets two nice accessories: a gun and a megaphone, which is a new piece. 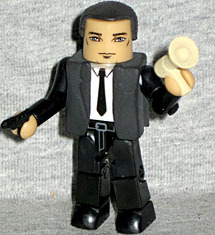 I love that we got an Agent Coulson toy, I just wish it looked more like him. Even the mightiest of Asgardians knows that it is best not to trifle with the Frost Giants. Their fearsome reputation is known throughout myth and legend... a race one should think twice about crossing. What do the Frost Giants have in store for Asgard and Thor? Will the peace that has been kept for many years be suddenly broken? 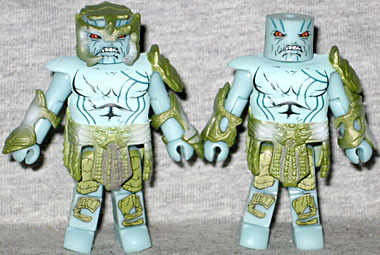 There are three Frost Giants, but only one of them is available in the two-packs: the others can only be had single-boxed in the POP displays. They did the same thing with the Hammer Drones in the Iron Man 2 Minimates, but it's (slightly) less annoying here. "Frost Giant 1" can be recognized by his large headgear and his bulky chest cap: neither Frost Giant 2 nor Laufey have those. Just as in the other movie line, the Frost Giants aren't actually very "giant" - even having a piece in the waist to bump up their height doesn't help very much. If, like me, you end up with multiples of this Frost Giant, try turning the armor pieces around - it helps differentiate them. Performing research in the desert to discover the mysteries of the cosmos, the last thing Jane Foster expects to stumble upon is a man lying unconscious on the ground. She befriends a mortal Thor and attempts to help him discover what it is he needs to learn to end his exile and return to Asgard. In the comics, Jane Foster was a nurse (so that she could hang around his civilian identity, Dr. Donald Blake). She's since been upgraded in the comics, so she's a doctor herself now. In Earth's Mightiest Heroes, she's an EMT, and in the live-action movie, she's apparently an astrophysicist. 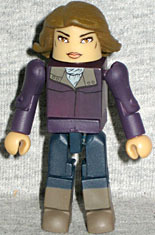 This is far from the first Natalie Portman toy ever released, but since Lucasfilm licensing continually rebuffs Art Asylum's advances, she's never been a Minimate before. The hair is new, and it does a great job of duplicating her flat 'do. She's wearing the purple jacket, blue pants and tall brown boots seen in the triler when she first meets Thor in the desert. At one point she was going to have a new jacket mold, but instead it's just been painted. I'm a total sucker for "civilian" toys - I like having normal people for my heroes and villains to fight about. That's why I bought both Agent Coulson and the chase Jane Foster, and why I was elated when my local comicshop got the single-pack display, and I was able to pull out Selvig. Bonus review time! If you've played the Acura-sponsored viral game, you may have found the file identifying Dr. Erik Selvig as a friend of Jane's father, and revealing that he worked at Culver University (the same school seen in The Incredible Hulk). He's played by Stellan Skarsgard (who's been toyed* in the past as Bootsrap Bill), and the likeness is wonderful. The hair (same as Coulson's) and jacket come from the Punisher War Zone Frank Castle figure, and his chest is painted with an avuncular sweater over a powder blue shirt. There's nothing exciting about this figure... unless you, too, want some cool civilians in your collection. *yeah, I added a new meaning to the verb tense. Big whoop, wanna fight about it?